When my Welsh Terrier, Bonsai, had emergency life-saving surgery, Conker helped me to nurse him, telling me if Bonsai was about to lick his stitches, and fetching blankets for Bonsai's bed. Photo here is when convalescence was almost complete. The operation gave Bonsai another 18 months in tip-top condition - very much quality time. Sad to report that Bonsai then became ill with liver cancer. The vet tried injections to help, and I was able enjoy having Bonsai for a few more precious weeks. In background : white Antirrhinum. The comments below were made prior to 21st Nov. 2008 when Bonsai went to doggie heaven. Rest in peace my special boy. Just the sort of nurse I would like. I worked in a hospital for 17 years (but not in nursing) although I never saw one like this unfortunately. Saw a few 'pat dogs' though and they were doing a great job. Yes, the PAT Dogs are wonderful. They certainly cheer up people in hospitals and nursing homes. The charity dog shows we attend in the summer are sometimes in aid of PAT Dogs. Lovely photo.We could do with more PAT dogs as I think they do a fantastic job. I haven't seen your lovely avatar dog on your photos? Hi TT I will put some up.We sadly had to let her go over the Rainbow Bridge nearly two years ago and I thought it a nice way to remember her by taking her name for my user name.Tina was already taken so I just added the 2 on the end. So sorry you had to let her go. I can see in the photo that she is elderly. I'm glad this gave you a giggle. 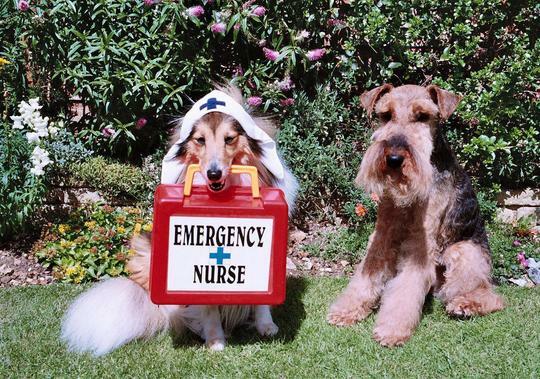 Being a RN I absolutely LOVE this photo!!!! I would be glad to have Conker on my team anyday! It is terrible to have a sick pet, poor Chummy has a collapsed trachea, which is treatable but not curable..She can't breathe when she is ill and takes many medications..She is currently fine. Thank God. Hope Bonsai is doing well, and that Conker is monitoring him! Maybe I could send Scrunchion to you guys so that Conker could train her in????? Glad to know Chummy is currently fine. We worry so much over our pets. Bonsai has not been so well again today. Conker is doing his best to help, but Bonsai is an old boy now. Chummy is good, respiratory wise ....however, when I arrived home from work this morning "dad" was on the patio-one of the girls had serious "upset" in the porch..
We had a major clean-up on our hands, then had to clean Chummy in the yard! It's on the go...I can deal with this, but when my little canine daughter is collapsing to the floor without breath, I freak! When the above photo was taken about 18 months ago, Bonsai had recovered amazingly from the removal of a tumour which was the size of a large orange and weighing 14oz . His spleen alongside the tumour was also removed. Surprisingly he'd shown no outward signs of anything wrong. Just collapsed one day. All the tumour had been tucked up inside. The vets did a brilliant job. Ladybug loves this picture. She had a bout with a small tumor and infected female organs 3 months ago. What a time we had. Happened on a Friday night. No emergency vet facities nearby. She had to wait until Monday for treatment and her kidneys had started to shut down by then. well, she made it but because she is so little, she couldn't afford to lose the pound that she lost. She weighed less than 2 pounds at the time of surgery. I know Bonsai is geting up in years but I am hoping he has a few good years left. Conker makes such a lovely nurse. Priceless pictures of your dogs, they really like to act I think. I love dogs and I can relate to your gorgeous pics too. Great you have such a nice garden for them to play in. Thanks. I keep some areas of lawn so that my dogs have space to play and practise their trick routines. In the kitchen I prepare a drink for both dogs in two plastic dishes on the worktop. Conker is nearby watching. Bonsai is asleep in his bed in the studio nearby. Conker, with no instruction from me, goes out of the kitchen, gently tugs at the blanket edge of Bonsai's bed, just enough to wake him and indicate, there are 'goodies' on offer in the kitchen. He gently escorts Bonsai back into the kitchen. When both dogs have finished their drinks. Conker picks up his own plastic dish, stacks it inside Bonsai's dish and then brings both dishes back to me, and does a 'beg' holding both stacked dishes in his mouth. It sounded quiet nasty what Bonsai had and it must have been such a worry for you all.Isn't marvelous though what the vets can do with their skilful hands.I am glad that Bonsai has made a full recovery and can see what a kind and loving owner you are to both of your dogs. Thanks. Yes it was fantastic that Bonsai made such a good recovery. So we had a wonderful 18 months of 'extra time'. Now he has liver cancer, but, once again, the vets are doing their best to help. ~ Conker is a gem TT-love to all! Do you think Conker should organise dog training classes ? Hi TT glad to hear of your good news and it looks like all our paryers and positve thoughts are working. We had an elderly cat that was diagnosed with Intestinal cancer and would never have survived any operation to get rid of it.She was put onto steroids which slowed down the rate of the cancer and she lived for another eighteen months before it got to the stage where she couldn't go on much longer.She had a stroke in the end and so after a flying visit to the vets and a good examination it was decided to let her go.She was 21 1/2 so had had a good life. Think positive and don't give up,enjoy every day that you can with Bonsai and hopefully you will spend a lot more time together to enjoy his tricks and the love that you can both give each other. Thanks for your messages both on the comments and privately. These are a great help to me. Thank you. I'll continue to give reports on Bonsai's progress on this thread here. So cute brought a smile to my face. I'm glad you like the photo. I actually made that nurse's hat for Conker. You make such lovely hats, that I thought you'd like to know that! Both my dogs really love dressing up. This morning at the vets Bonsai was given (well, charged a fortune) for a vitamin and mineral supplement which should help him cope. I looked up this supplement on the internet and was rather surprised to find that it is most usually prescribed for foals and horses! Lots of high pitched barks and wet sloppy kisses from chummy and scrunchion!!! Bonsai wants to know if he can run in the the 3.30 horse race at Newmarket. you know which 'horse' to put your money on ! Arlene ~ collected your winnings from the earlier race ? ~ i'm thrilled that he is still himself as I think the more you let him do normally including telling him he is fabulous all the time the more his spirit and will to live will strengthen- they just lap up praise and love!I'm sure we kept Mags going by joint willpower!His and ours! will be putting my money on him! Tasteyg ~ Thanks for your kind words. Rexi sounds a lovely girl. It's so sad when dogs go blind. Bonsai's sight has also deteriorated lately and I'm following the advice to keep all furniture etc. in its usual place, because dogs then don't continually walk into objects. Special caution when opening doors, so that dogs aren't knocked in the face. Arlene ~ You're right that willpower can do so much , whether helping an old person or an elderly dog to keep up their enthusiasm! Medicine meant for PIGS ? Wow. If it worked, that's all that matters. I'm glad Summer doesn't need that any more. Sounds like Summer needs some wellies for that mud. Yes I am lucky. Anthony is a super vet. The practice has several branches. plus the fact that the garden suits my dogs ! Lovely dogs, cute picture with bittersweet story. Thought I hadn't seen any of your news lately. Being without internet has a name: WING. No idea how long the vet's magic medicine can keep Bonsai so much better, but every day is a bonus. Yes, he is responding to treatment better than expected. As mentioned above, reached his 13th birthday last Sunday, so I uploaded the Welsh flags photo in celebration ! Yes, Bonsai has been pestering me for food all day ! After clocks go back, does Summer expect all her meals an hour early? All being well, Bonsai has a check-up at the vet next week, so let's hope he gets a good report. I really appreciate everyone's support in all this. They let you know when they are hungry! Do clocks get altered in Brazil ? Bonsai enjoyed his 13th birthday. That's why I uploaded the next photo with his Welsh flags. well what a fab site,every photo is a star photo,it was wonderful of you to share these photos,i think they may be humans in disguise. Hello Lightdiane . Thank you. Must admit nearly all my garden photos feature dogs. Lol. The only reward its the birds singing :o) they dont mind the clocks! We are treasuring every moment together. On 21st November 2008, Bonsai went to doggie heaven. Have you seen my photo of Conker the Sheltie in front of my raised bed, entitled CAN YOU SPOT THE REAL DOG ? That has a model of a Wire Haired Fox Terrier. I would love it if you copied that model to make your giant dog ! If pictures of Wire Fox Terriers would help you make the fountain, I can send you those when the weather warms up and you're ready to start. It is understandable that with the sculpture, you are likely to make it more of a 'cartoon'.. Sorry it that's the wrong word, but you know what I mean. Lol. Yes. Wirehaired Fox Terrier is ideal for making into a model for your garden fountain. You know you need the moustache, eyebrows and furry legs. Lol. Tails are not now docked, so to be up-to-date, make the tail just a bit longer than on the Fox Terrier model in my other photo. Your garden fountain is sure to be something special. Will it be a mixture of metal, stone and pottery ? I'm really looking forward to seeing photos of each stage of the construction. Just let me know when you would like some drawings/silhouette pictures etc.